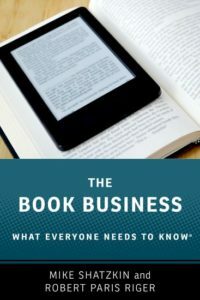 In the past 10 years (since the mid-2000s), the ebook has arrived and the amount of shelf space for books in physical retail has declined, as book purchasing has continued to move to the Internet. This has put pressure on publishers’ distribution costs, as we discussed in a prior post. In the 10 years before that (mid-1990s to mid-2000s), online bookselling began at what was, we now know, the very peak of book retailing, when the superstore chains B&N and Borders had built out hundreds of 100,000+-title stores and still owned mall chains Dalton and Walden that had many hundreds of smaller stores. And that was on top of the largest-ever network — many thousands — of independent bookstores, many of which were themselves superstores. In the 10 years before that (mid-1980s to mid-1990s), Wall Street cash enabled the two big bookstore chains to build out their superstore networks, stocking publishers’ backlists deeply. With so many enormous stores opening, publishers received a bonanza of store-opening orders that went deep into their lists and were relatively lightly returned (until the store-opening process reversed itself 20 years later). In the 10 years before that (mid-1970s to mid-1980s), the two mall chains (Dalton and Walden) rode the growth of shopping centers to a position of great importance in selling books to the public. They became the drivers of the bestseller lists. In the same decade. Ingram and Baker & Taylor built reliable national wholesaling networks, enabling the chains and a growing number of independents to replenish stock of unsold books quickly, increasing stock turn and profitability for booksellers (and lowering returns to everybody’s benefit). In the 10 years before that (mid-1960s to mid-1970s), the department stores started to yield their strong position in book sales, victims both of their own structured discipline (open-to-buy rules) about inventory control that reduced their title selection and of the growth of the malls. The malls inadvertently doomed the department store concept (even though department stores were the “anchors” that made malls possible) by enabling specialty retailers of all kinds, including bookstores, to provide a better shopping experience than the department that sold those goods in the department store. In the 10 years before that (mid-1950s to mid-1960s), an increasingly affluent society saw an ever-expanding number of bookstores while, in that era, mass-market paperbacks became ubiquitous in drug stores and newsstands, vastly increasing the number of places where Americans could find and buy books. And the 10 years before that, which takes us back to the end of World War II, saw the birth of mass-market paperbacks and the development of modern publishing sales forces in trade houses. This was, in retrospect, the beginning of a half-century of uninterrupted growth for American book publishing. It has not necessarily now come to an end, but the growth of the segment controlled by big publishers may have ended. What happens now? The online book market is likely more than half of the total book market. That is, books purchased online — print and digital — exceed the number sold in retail stores (obviously all print). Amazon is the single most powerful retailer, and they have also made themselves the first stop for any self-publishing or small-publishing entity that wants to reach readers. Ingram and the bigger publishers offer full-line distribution services to the most ambitious of those and to everybody else who wants to reach the whole book market. Until the last 10 years, all the developments that affected book publishing tended to grow the availability of books relative to the availability of other media. When mall stores or superstores grew, there was no associated lift for television shows or movies (although recorded music also benefited from the malls). That is no longer the case. For the first time, really, books are competing with everything else you might read or watch or listen to in a way they never did before. Online doesn’t care what is in the file it displays. This is a qualitative difference in the nature of book availability growth compared to everything else that has happened in the lifetimes of anybody in the business. The fact is that books used to live in a moated ecosystem, independent of what was going on in other media and book readers’ communication streams. Since ubiquitous broadband, that is no longer true. This presents publishers with two challenges they never faced before. One is to take advantage of the opportunity to promote books to readers by tying them in to other media and events in ways that were never before possible. This is digital marketing promoting discovery. In fact, a greater percentage of the potential audience for any book should know about it within a few months of its publication than ever before, if publishers do their jobs right. But the other is that publishers need to be alert to changes in book reading habits that are bound to occur because of integrated media. Yes, the publisher can promote the book to somebody watching a related video or reading an email on a related subject. But it is also true that promotion for movies and emails from friends can interrupt a reader in the middle of a chapter if they’re reading online. This is probably changing the way people read books and might even change how they want their books edited and shaped. Publishers who pay attention will see those changes as they occur. We can interrupt people doing something else now to tell them about a book. But they now, in turn, can easily be interrupted while they’re reading the book. Digital change and media integration cut both ways. It is very early days for this reality. It only really occurs because of the combination of broadband and reading on an Internet-enabled device. That’s a relatively recent and still-growing circumstance. We don’t know where it will lead.